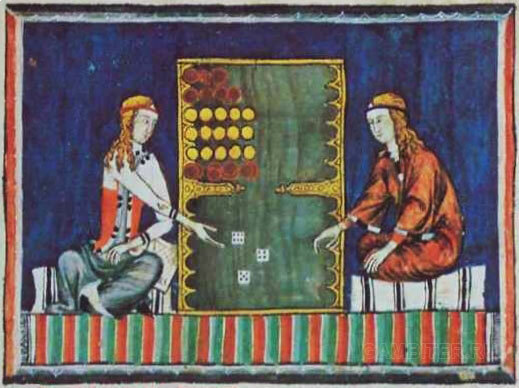 Backgammon is a dice game, and dice games have been developed in every part of the world. The most ancient possible ancestor of the game dates back five thousand years to the ancient civilization of Sumer which flourished in southern Mesopotamia in what is now Iraq. In Ur of the Chaldees, the Biblical home of Abraham were found five game layouts which bear some slight resemblance to our backgammon boards. They were made of wood, intricately decorated with a mosaic of shell, bone, lapis lazuli, red paste, and red limestone set in bitumen, and adorned with animals and rosettes. In another part of ancient Mesopotamia, archaeologists found a similar gaming board. This one was less lavishly decorated, but under the board, in neat piles, were found two sets of playing pieces and dice. One set of men consisted of simple black squares, each inlaid with five lapis dots; the others were shell squares engraved with vignettes. Each player apparently had seven men and six dice. Boards dating from 1500 BC. were found in King Tutankhamen's tomb in the valley of the Nile, and even at Enkomi on Cyprus, then an Egyptian colony. One board contains Queen Hatshepsut's name, and with the board were found lion-headed pieces, the ancient symbols of royal power. Wall paintings in many Egyptian tombs portray people playing the game, suggesting that it was played by common people as well as by the aristocracy. In Rome the game rivalled the Circus Maximus as a pastime and was regarded as the sport of emperors. Excavators of Pompeii found a backgammon table carved in the courtyard of almost every villa. The Roman legions must have brought tabulae with them through Europe. But except for the fact that the name survived in Britain as "tables", it does not appear that Rome's conquered lands were immediately receptive. It seems to have been the return of the Crusaders that effectively spread the game throughout Europe.